I'm really happy to be here sharing this holiday card with you. Creating this card really got me in the holiday spirit! I started out by creating the background. 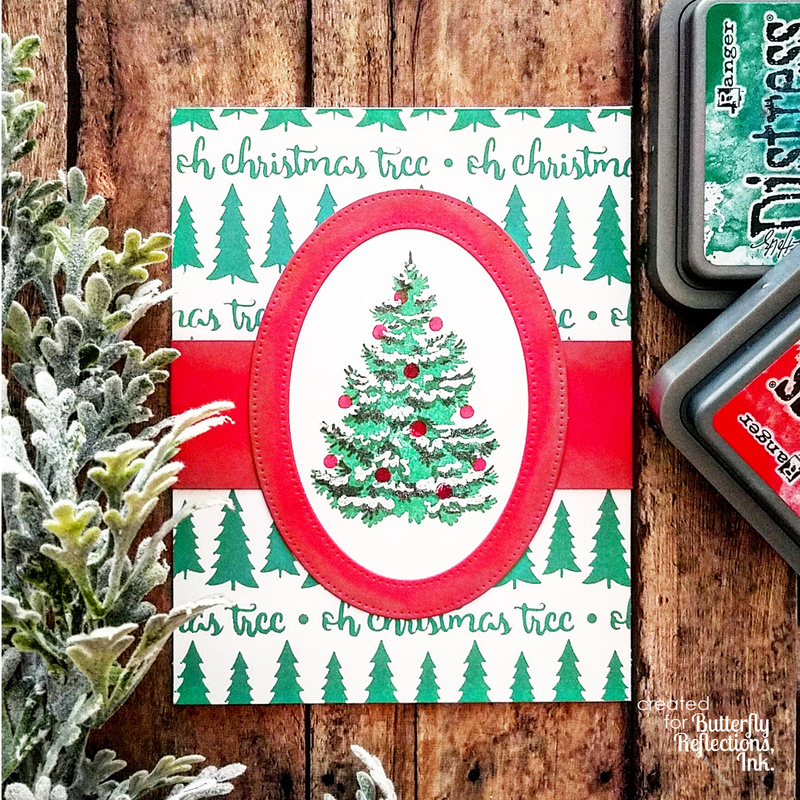 I used the Echo Park Oh Christmas Tree stencil and my Lucky Clover Distress Oxide ink and blending tool to create the vibrant background. 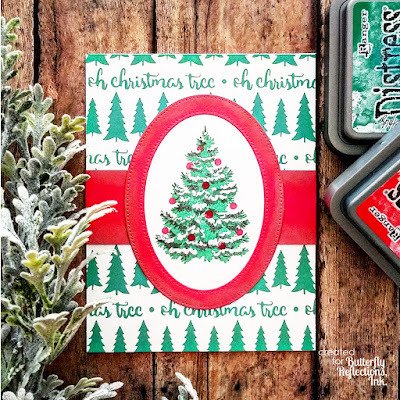 I then used a Hero Arts Christmas tree layering stamp to create my Christmas tree. I used various shades of green ink and then used Versamark ink and white embossing powder on the last layer to create the snowy look on the branches. I then used a small circle stamp and red pigment ink to create the ornaments. Because I was adding these ornaments as the last layer on the tree, I knew I needed to use pigment ink since it would sit on top of all the other layers of ink. After finishing the tree, I die cut it out with an oval die, and then I used the frame die in the set to cut a red frame from scrap cardstock. I brushed the edges with Candied Apple distress oxide ink just to give the frame some depth. I also cut a wide strip of the same red cardstock and treated the edges with the same red distress oxide ink. Now it was time to put all these different elements together. I adhered my stenciled background to my card base, and then glued my red strip across the front. I then put my oval Christmas tree piece on top of the red strip and finished off the card by gluing the red frame on top of the oval tree piece. Thanks for stopping by today, and Merry Christmas!